After breakfast a few of us decided to go to the beach. It took us all of two minutes to walk slowly to the water's edge. Jackie, a new friend and myself decided to get in the water. Everybody else thought we were crazy because it was cold. And it was cold! It took a couple minutes to get used to the temperature, but once I did, I really enjoyed myself. We relaxed in the water, conversing with one another and our new and old friends we stood on the beach. Off in the distance, we could see a large statue on a hill. A few of us decided to check it out before we had to leave for the day. The hill was not too far from where we were. A few minutes walk across the beach later, we were at the entrance of another temple, Naksansa Temple. It cost money to go in and also seemed like a bit of a walk still. We decided we had a good enough view from there, which was true, and that it would be better to get lunch instead, which we did. 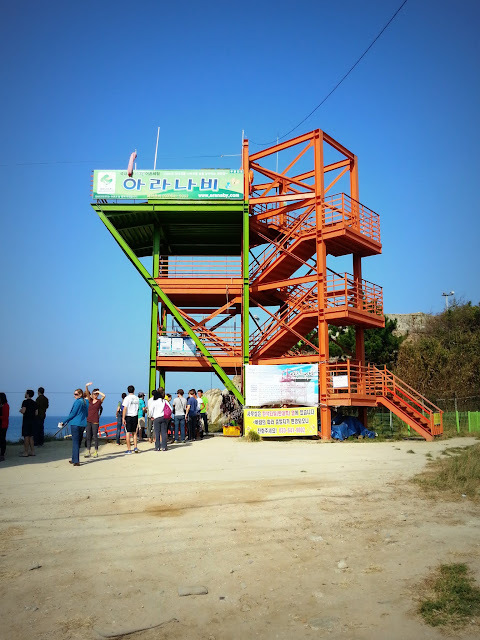 After eating some cheap convenience store burgers, we hopped on the charter bus and headed to Jumunjin Beach for ziplining. I had never been ziplining, but I have always wanted to be Spider-Man, so I was excited. For whatever reason, my stupid active imagination, I was disappointed to learn we would have harnesses attached to us while ziplining. I just wanted to hold onto a rope! Jackie seemed perplexed I would think that. "It's for safety," she said. I replied, "It would be more fun that way." Then she asked, "What if you let go and were hurt?" To which I simply stated that you would not let go because you would get hurt if you did. I have never been accused of being "logical," whatever that means. The ziplining itself was fun. I went last because that is what I do. The tide was low, so we went over only a little bit of water instead of what we were expecting, THE OCEAN. Nobody seemed to care much. The group was in a great mood, but it was time to head home. And that concluded our hiking and ziplining weekend with When in Korea. It was one of the most enjoyable weekends I have had in Korea. Alien Nation - Seoraksan National Park, Korea Rep. It was very exciting! I want to go ziplining again!